Dena Rao leading first pitch of Granitarium (17), Mt Frankland. Photo by Jena McDowall. As we head into August, it’s time to start thinking about the warm sunny days of spring that will soon be upon us, just perfect for planning climbing trips. CAWA has a trip planned for the Queen’s Birthday long weekend to Mount Frankland in the picturesque Karri forest north of Walpole, 400km south of Perth. For the uninitiated, Mt Frankland is a 422 m high granite dome set in the middle of a beautiful karri forest, conveniently located in the Mt Frankland National Park. The main and most worthwhile climbing is on the main dome. 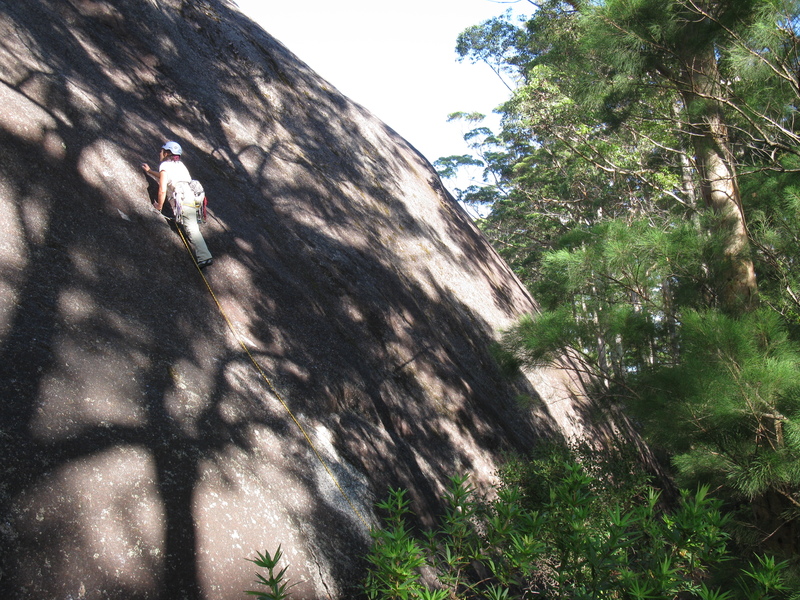 Best known for its slab and face climbing, you will also find the odd crack as well. It involves multi-pitch climbing with a mix of bolted and traditional. You can just do the single pitch stuff but will run out of climbs fairly quickly and it is only possible to top rope a few climbs from the bottom. To get a better idea of the climbing, check out the West Australian Rock or the South Coast Rock guidebook and the newer climbs are detailed on the CAWA website at the link Mount Frankland New Climbs. Camping is not allowed at Mt Frankland but comfortable sites with a basic camp kitchen and drop toilet are not too far away. Water is generally available but this is variable and you should be totally self sufficient. BYO firewood. The road off the main highway is dirt and can be in variable condition, though always 2WD friendly. It’s always a great weekend away and a good chance to meet other climbers. There are lots of other outdoor activities in the area including kayaking, bushwalking and mountain biking. We will be keeping a close eye on the weather as Mt Frankland can get a bit damp, even in spring. Please note that CAWA trips are only open to current members. Non-members who are interested in coming can join online here: Become a CAWA member. If you have any queries or to register for the trip, please email me at megans@climberswa.asn.au.